In her highly-anticipated appearance before a Senate subcommittee on Monday, former acting attorney general Sally Yates testified that she had warned the White House that disgraced former national security advisor Michael Flynn had made misleading statements about his contact with a Russian official—and that those lies had been repeated to the American people. Yates was called to testify before the Senate Judiciary Subcommittee on Crime and Terrorism concerning her discussions with the White House just prior to being fired in late January—a branch of the ongoing probe into possible coordination between the Trump campaign and Russian operatives, whom US intelligence chiefs assess were behind last summer’s infiltration of the Democratic Party and subsequent leaks of Clinton campaign emails. Yates warned the White House that Flynn had been disingenuous about his December communications with the Russian ambassador, Sergey Kislyak, which Yates and other agency officials deemed inappropriate and potentially illegal. Despite her warning, the White House chose to remain silent about Flynn’s transgression for nearly two weeks. Trump’s hand was eventually forced by a series of intelligence leaks to the press. Asked by committee chairman Senator Lindsey Graham on Monday about what she told the White House regarding Flynn, Yates said that she had two in-person meetings and one phone call with White House counsel Doug McGahn. 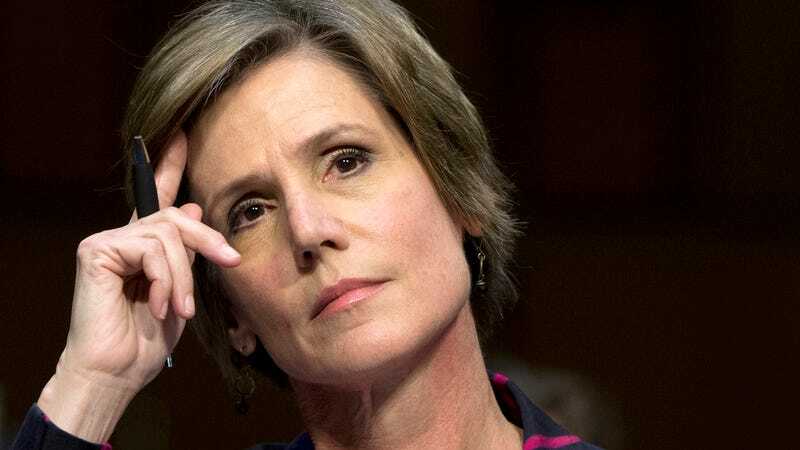 Yates said she contacted McGahn by phone on January 26 and told him that she had a “very sensitive matter” that couldn’t be discussed by phone. Yates went to McGahn’s office later that afternoon with a member of DOJ’s national security division, who she says was overseeing the Flynn matter. “We began our meeting telling [McGahn] that there had been press accounts of statements from the vice president and others that related conduct that Mr. Flynn had been involved in that we knew not to be the truth,” said Yates, emphasizing that portions of her conversation remained classified and she couldn’t discuss them at the open hearing. Yates detailed two reasons for notifying the White House of Flynn’s dishonesty. First, “we felt like the vice president and others were entitled to know that the information that they were conveying to the American people wasn’t true,” she said, adding that DOJ didn’t believe Pence knowingly gave false information to the press. Flynn repeatedly denied discussing US sanctions imposed against Russia in the wake of the 2016 campaign-hacking scandal—conversations that he was not legally authorized to engage in prior to the inauguration. He backtracked, however, after a flurry of news reports contradicted his word. He claimed to have “no recollection of discussing sanctions,” but added that he “couldn’t be certain that the topic never came up.” As it turns out, the topic was broached, though US officials emphasized to the Washington Post in February there was no evidence of Flynn making any explicit promises to the Russians. Yates’s warning, it seems, was not the first Trump received regarding Flynn. Former Obama administration officials told NBC News on Monday that President Obama had also personally warned Trump against hiring Flynn during a 90-minute conversation that took place 48 hours after the election. (Ninety-five days would pass before Flynn was fired.) A senior Trump administration official, attempting to downplay the urgency of Obama’s warning, told NBC that it seemed as if Obama was merely joking. In late March, Flynn offered the FBI and congressional officials testimony about the Trump campaign’s potential ties to Russia in exchange for a grant of immunity from prosecution. So far, there have been no takers.